Wow, what a show. I’m having a difficult time coming up with a single adjective that would do last night’s experience any justice. 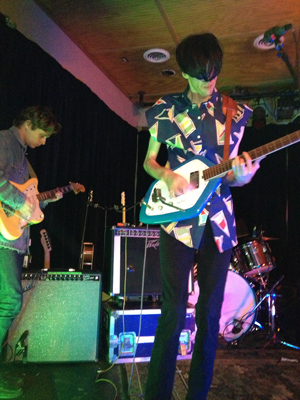 Deerhunter, Jackson Scott, and Mas Ysa at Proud Larrys‘, April 25th, led to quite an interesting evening for the locals. Throughout all three sets, I think we all forgot we were even in Oxford. Jackson Scott live at Proud Larrys’ in Oxford, Mississippi. Photo by Joseph Climer. Mas Ysa live at Proud Larrys’ in Oxford, Mississippi. Photo by Joseph Climer. Mas Ysa, a pop-trance solo artist out of Canada, began his set with an instrumental that reminded me of a digitized mashup of The Tree of Life soundtrack. He chugged cheap wine, fine tuned tiny knobs, and danced around on stage more than the awed crowd that stood before him. 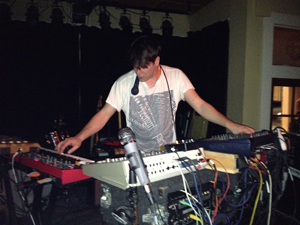 As he wailed into his microphone while pounding on his synthesizer, Oxford wasn’t quite sure how to react. Mas Ysa has taken pop music to an entire new level, as he is more of a gospel DJ descended from Pop Heaven (Canada). I would tell you where to purchase his work, but he announced after his set that he is twitterless, without any recordings, and does not exist. 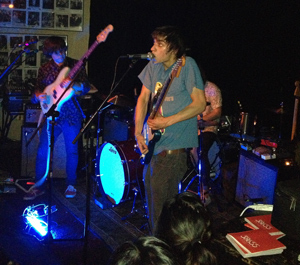 Deerhunter live at Proud Larrys’ in Oxford, Mississippi. Photo by Joseph Climer. Deerhunter, the moment we’ve all been waiting for. Being a five-piece out of Atlanta, Georgia, Deerhunter is currently one of the South’s finest modern sounds. With their never-ending ambient rhythms, layered in diehard drum measures and some eerie lead guitar, these guys remind me of the importance of southern roots in the music world. They built up a wall of sound that crumbled into the crowd, escaped through the open doors of Proud Larrys’, and was probably heard throughout most of The Square. They have announced the release of their sixth studio album, Monomania, dropping May 7th, 2013. In the meantime, swing by The End of All Music, and pick up one of their previous albums in stock.